Australian Lacewood. Pau Ferro. Curly Redheart. Osage Orange. Birch. Cocobolo. White Ash. Padauk. Douglas Fir. North American Rock Maple. Spalted Mango. South American Rosewood. Heart Pine. 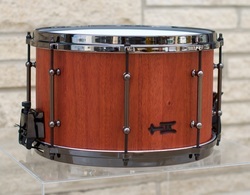 Bubinga. Yellowheart. Spalted Hackberry. Flamed Satinwood. Red Oak. Quilted Cherry. Figured Claro Walnut. Bullet Hole Pine. 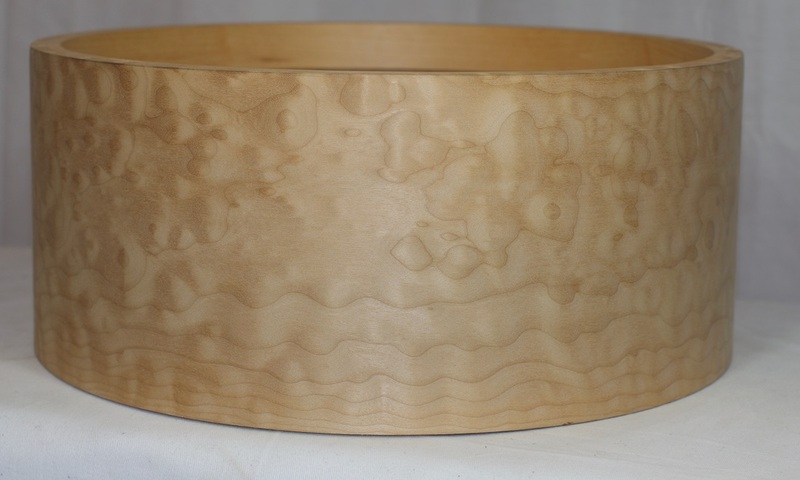 Flame Maple. Purpleheart. Black Limba. Koa. Wenge. Zebrawood. One-Ply shells are made by soaking solid boards for weeks or months then applying steam and pressure until they’re pliable. A taper is cut on each end of the board then it’s bent around on itself and glued in place. What’s cool about this is that the board is now reformed to its new shape. That is, if you cut through the board at this stage, it doesn’t spring back to flat; instead, the relaxed lignum in the wood cells is “reset” to the new shape. That being said, unsupported one-ply shells can “egg out” over time, so they’re made with reinforcing rings to keep them true. Most TreeHouse Solid shells come from this category. Segmented shells usually show up in one of three kinds: Stacked Rings, Blocks and Stave Construction. There's a neat machine out there that cuts big circles out of solid boards. 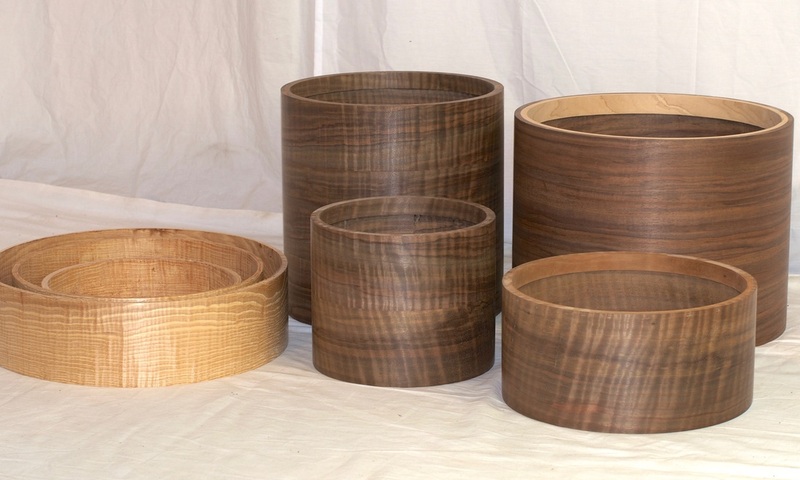 Stack different sizes of these large-diameter skinny wooden doughnuts on each other to make bowls or same sizes of rings to make snare drums. Blocks of wood can be stacked on each other much like how masons stack bricks. Stave construction is sort of like looking down on Stonehenge--upright boards gathered in a circle like how barrels and conga drums are made. Each of these segmented methods have pros and cons, and from this category, TreeHouse has latched on to Stave Shells. Some folks dig they way they look while others don’t like their looks--they do enable you to make solid drums out of woods that don’t work well for the one-ply process, as well you can mix woods for interesting looks and sounds. Stave Shells can be relatively thin, about a quarter inch thick, or quite thick at over an inch. Sometimes the thin shells have reinforcing rings installed for added stability and to focus the drum’s attack. Cored or Carved shells are like the name implies--they're carved out of a large solid piece of wood or cored out of a log. These shells could arguably produce drums that exhibit the purest sound characteristics of their constituent woods, but are expensive and difficult to make. Most domestic species of wood wouldn’t survive these processes as they’d prefer to split instead of stay in tact. There are a handful of makers out there who specialize in these drums, but TreeHouse uses other style of solid construction. OK. So what’s the big deal here? We’re talking about the potential sonic properties of wood vs. wood + glue. Lots of folks talk about the sonic properties of their shells’ woods, but few talk about the sonic properties of adhesives. The thing is NOT that one is better than another as untold millions of plywood drums in the world sound great. There is a difference though. 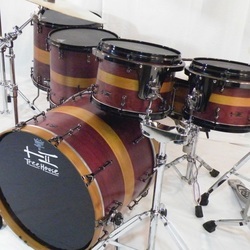 If you really want to hear what different woods do to affect the sound of drums, make a bunch of drums the same way but with shells of differing amounts of glue and see what happens. Everything else remaining equal, as the amounts of glue in a drum’s shell go down, a richness and fullness of tone increases. It’s not that you loose low end or any highs, but as a drum “gets more solid,” the mids open up and the drum sounds bigger. Think of the difference between a singer laying into a great studio mic through a so-so preamp before hitting tape vs. running into a high-end German vacuum tube preamp. The mic and recording media contribute to the sound, but that preamp can take a great sound and really make it amazing! So how much glue are we talking here? 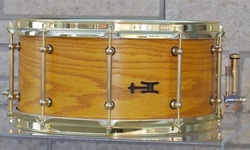 Imagine a normal 5x14 snare drum. Toss its bare shell on the floor...then stack eight more of those shells on top of the first one. This column of wood represents the area of glue in a normal 10-ply shell since there’s a layer of glue between each ply. Now check out your stave shell. Let’s say it’s about a half-inch thick with 24 staves (so none of the 8 lugs land on a seam). That’s about 60 square inches of glue--5x1/2x24. In comparison, a regular 8.5x11 sheet of typing paper is 93.5 square inches in area. Now look at a one-ply shell where the glued overlapped seam--called a scarf joint--spells out an area of glue smaller than a postcard--maybe about two post-it notes. To be fair, one-ply shells are built with reinforcing rings (so add about 36 square inches of glue for a pair of 7/8” high rings) but so could every other wood shell. ​The idea is that the wood is allowed to vibrate differently across these different construction schemes. That makes them sound different--but which is right for you? My point isn’t to decide for you or try to convince you of anything. Just take these thoughts and add them to the work you’re already doing of choosing what’s right for you!